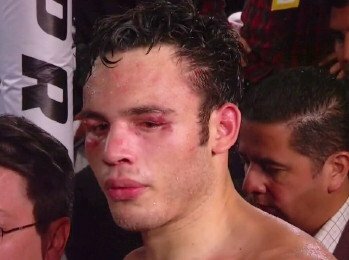 Julio Cesar Chavez Jr was once a top contender, and even a good champion. In 2011, he won his 43rd contest and captured the WBC world middleweight title from the previously unbeaten Sebastian Zbik. He would then make 3 consecutive defences before taking on Sergio Martinez, and losing. In the fight with Martinez he went in with a record of 46-0-1 but was really dominated in the fight. Martinez was simply the better man in every department and the only thing that went Chavez Jr’s was a knockdown in the twelfth round. It was a good punch, but ultimately it proved too little too late as Martinez surprised and came away with very wide scorecards. This was really the end of Chavez at the top level and his career has really stalled since. Whilst I cant claim Martinez has done much better, he is a forty year old man, Chavez isn’t yet thirty. Chavez Jr fought just once in 2013, then once again in 2014. Both of these fights were against Brian Vera. This is a man who had a record containing 6 defeats before he had stepped in the ring with Chavez, and has not won a fight since. The first fight was so close that it forced the rematch and even in the second fight it was far from a great performance. Nevertheless Chavez now has a record, which reads 48-1-1 (32KO). Pretty good by anyone’s standards, and with a huge following in Mexico, it would really be a promising career, but personal and legal problems as well as his mixed attitude towards the sport leave many feeling like he is throwing away some his chance. His next fight is against Andrzej Fonfara 26-3-0 (15KO). Fonfara is probably most recognisable as the guy who lost to Adonis Stevenson last year. He has beaten some tough guys but isn’t really a world level talent, and if it wasn’t for the shocking performances Chavez put in against Vera, he would easily favoured to win this one. Whilst he is still the favourite, you get the feeling that anything can happen. The truth is if the man is able to put on a good show in this fight then there are tons of opportunities for him. Carl Froch has expressed a lot of interest in facing him, this could be the opportunity to pick up another title and dethrone one of the best fighters in the sport, even send him into retirement. There is also the opportunity of facing triple G. Golovkin is an established champion with a huge following, and the first man who is capable of beating him will get a ton of respect, because right now beating him looks to be an impossible task. Gennady Golovkin has been dispatching world title challengers with chilling ease over the past few years, and what you sense he needs is a big, strong, young fighter to have a try. These two could create a fight of the year candidate with ease. Everything depends on this fight though. A loss or another extremely close and controversial win won’t really be good enough. Chavez needs to win this one on wide margins, or preferably by stoppage to create that buzz about him again, the interest is there but it isn’t the same compared to guys like Triple G and Sergey Kovalev who have that aura about them now following their dominant victories.